Rajkumar, M., Sivakumar, B., Arivarignan, G. (2011). Continuous Review Perishable Inventory System with OneSupplier, One Retailer andPositive Lead Time. Journal of Industrial and Systems Engineering, 5(2), 80-106. M. Rajkumar; B. Sivakumar; G. Arivarignan. "Continuous Review Perishable Inventory System with OneSupplier, One Retailer andPositive Lead Time". 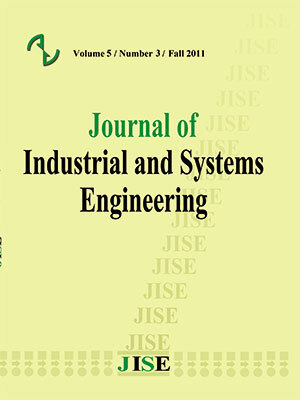 Journal of Industrial and Systems Engineering, 5, 2, 2011, 80-106. Rajkumar, M., Sivakumar, B., Arivarignan, G. (2011). 'Continuous Review Perishable Inventory System with OneSupplier, One Retailer andPositive Lead Time', Journal of Industrial and Systems Engineering, 5(2), pp. 80-106. Rajkumar, M., Sivakumar, B., Arivarignan, G. Continuous Review Perishable Inventory System with OneSupplier, One Retailer andPositive Lead Time. Journal of Industrial and Systems Engineering, 2011; 5(2): 80-106. 1Department of Applied Mathematics and Statistics,Madurai Kamaraj University,Madurai, India. 2Department of Applied Mathematics and Statistics, Madurai Kamaraj University, Madurai, India. We consider a two-echelon single commodity inventory system with one warehouse(supplier) at the higher echelon and one retailer at the lower echelon. The retailer stocks individual items of a commodity and satisfies unit demands which occur according to a Poisson process. The supplier stocks these items in packets and uses these packetsto: (i) satisfy the demands that occur for single packet and that form an independent Poisson process and (ii) replenish the retailer's stock. The supplier implements (s,S)ordering policy to replenish the stock of packets and the lead time is assumed to have exponential distribution. Though the retailer's stock is replenished instantaneously by the supplier if packets are available, and a random stock out period may occur at the retailer node when the supplier has zero stock. It is assumed that because of better stocking facility that is usually available at the warehouse, the items do not perish at the warehouse, but they do perish at the retailer node. It is also assumed that the items have exponential life time distribution at the lower echelon. The joint probability distribution of the inventory levels on both nodes is obtained in the steady state. Various system performance measures are calculated. The long run total expected cost per unit time is derived. These results are illustrated with numerical examples. Some special cases are discussed in detail. Journal of Production Economics 69(3); 307-315.
wholesale price discount policies;European Journal of Operational Research 194(2); 538-550.
dependent demand;European Journal of Operational Research 196(1); 177-185. European Journal of Operational Research 181(2); 753-766.
sensitivity;European Journal of Operational Research 188(1); 273-292.
under a returns policy;European Journal of Operational Research184(1); 356-376.
distribution between unit demands;Operations Research 22; 65-71.
retailer;European Journal of Operational Research 192(3); 904-917.